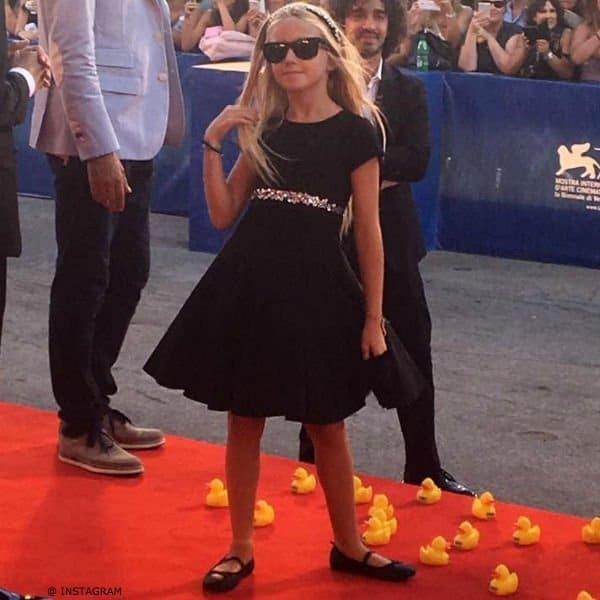 At the 73rd Venice Film Festival, the young actress Cloe Romagnoli was spotted wearing this perfectly elegant little black dress. As seen on the runway at Kids Fashion Week in Italy, this black neoprene dress by Monnalisa Couture is complete with an amazing diamanté embellishment on the wide elasticated waistband. Elegant, high-waisted dress with a full skirt of the dress is paneled and flares out beautifully, kept in place with many layers of tulle on the cotton jersey slip below. Complete the look with a pair of black patent leather shoes, black purse with diamanté embellishment and a fur cape.